After months of planning your wedding ceremony, you can look forward to unwinding in your own private Jacuzzi tub at Mountain Melodies! Spend each night of your honeymoon soaking in the tub as you soothe your muscles and feel the wonderful sense of total relaxation.The Jacuzzi tub also feels fantastic after hiking for miles through Great Smoky Mountains National Park or shopping for several hours at the Island in Pigeon Forge. After soaking in the Jacuzzi, you will sleep better than you have in months! Our honeymoon suite in Pigeon Forge TN features a seasonal gas fireplace to create the ultimate romantic ambiance! Cuddle up on the comfortable couch as the dancing flames put you into a trance and light up the room. The fire also makes a perfect background as you watch a romantic movie together on the large LED television. As a bonus, the flames will help warm your bones if you have been out exploring the Smokies during the winter months! 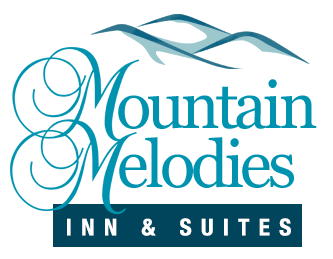 Mountain Melodies is situated directly on the Pigeon Forge Parkway so that you can conveniently access all of the great attractions, shows and restaurants from your honeymoon suite! Whether you are planning to spend a day at Dollywood or want to check out the Titanic Museum, everything is just minutes away. The Pigeon Forge Welcome Center is located right across the street so that you can pick up all the maps, brochures and coupons you need for a fun filled honeymoon in the Smoky Mountains! Forget about the hassle of packing a cooler and keeping it filled with ice throughout your honeymoon! Keep your bottle of champagne and other beverages chilled in your suite’s mini-refrigerator. If you get thirsty after a soak in the Jacuzzi tub or want some orange juice in the morning, the mini-refrigerator comes in very handy. It is also a great place to store your leftovers after enjoying some delicious southern cooking at the restaurants in Pigeon Forge! While staying at Mountain Melodies, keep in touch with your family and friends through our complimentary wireless Internet access! Upload pictures from your trip through social media and let everyone follow along with your adventures in the Smokies. You can also access the Internet to check the latest weather forecast for Pigeon Forge, find out showtimes and make restaurant reservations. Check out our hotel rooms in Pigeon Forge today to reserve your honeymoon suite in Pigeon Forge TN! We look forward to seeing you and your new spouse at Mountain Melodies!